"Locanda la Campana" is born from the desire to offer an alternative holiday in a place where nature, culture and traditions are definitely a pleasure to experience and where the culinary tastes are still a ritual for the pleasure of the palate. 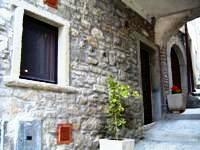 The Guest House is located in the centre of Agnone, a small and ancient village in Alto Molise area, known worldwide for the sound of its wonderful and millenary bells. With its artistic beauty, ancient history, the elegant mullioned windows, the stores, the carved lions, the fire that melts the metal in the workshops, Agnone has received the title of Orange Flag, and it is a member of the 100 most beautiful ancient villages in Italy since 2005.